This scene recreates the sight of a plane coming in to land at Kai Tak airport, the old Hong Kong international airport at the time in which the story was set, located on the west side of Kowloon Bay. It was famous for its spectacular low-altitude approaches over the densely-populated areas of Kowloon, including a tight last-minute turn at a height of just 300m in order to line up with the runway. Kai Tak airport was retired in 1998, after all services had been moved over to the new Hong Kong International Airport, 30km to the west at Chek Lap Kok. 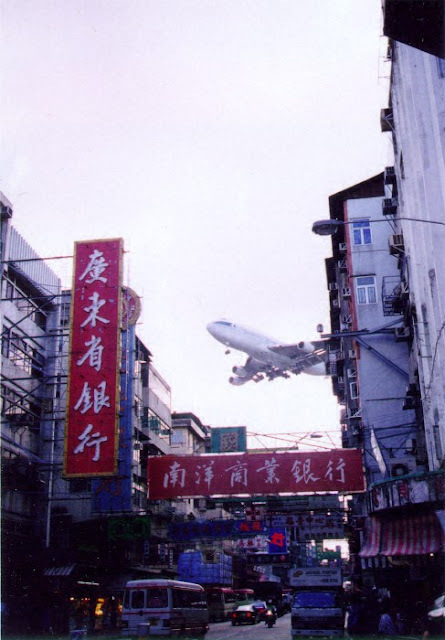 Photograph of a plane coming in to land above Kowloon. Cutscene Location: The location to trigger this cutscene is the Wise Men's Quarter, on the stretch of road just along from the Wise Men's Chemist. The cutscene occurs in the area marked with a red circle. This point can also be reached from the opposite direction, by walking along Altar Street and descending the stairs that lead down towards Wise Men's Chemist. See the screenshot below which indicates the "trigger zone" that will cause the cutscene to play when Ryo walks into it. The approximate zone for triggering the cutscene is marked in red. Timing: This scene can be triggered at any time. Other Information: For the cutscene to trigger, make sure that Ryo walks into the trigger zone. If he runs through it, the cutscene will not be shown. 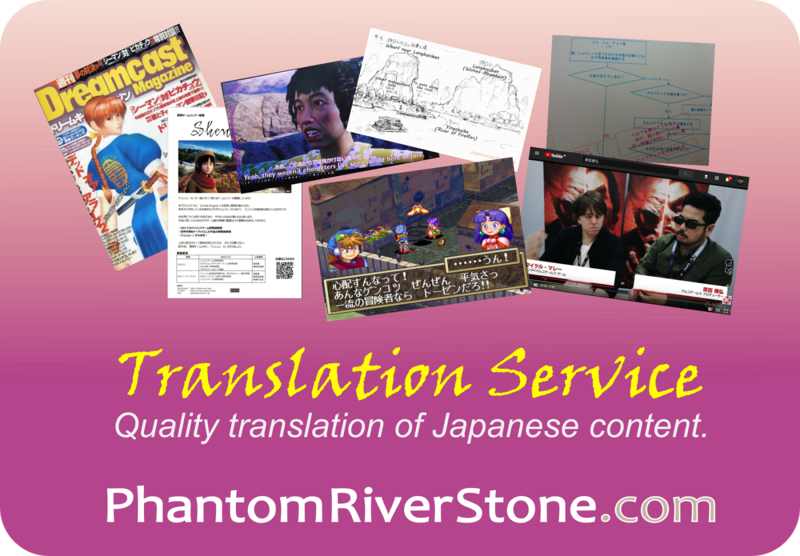 Also, once triggered, it will not play again until Ryo leaves the Wise Men's Quarter and returns. 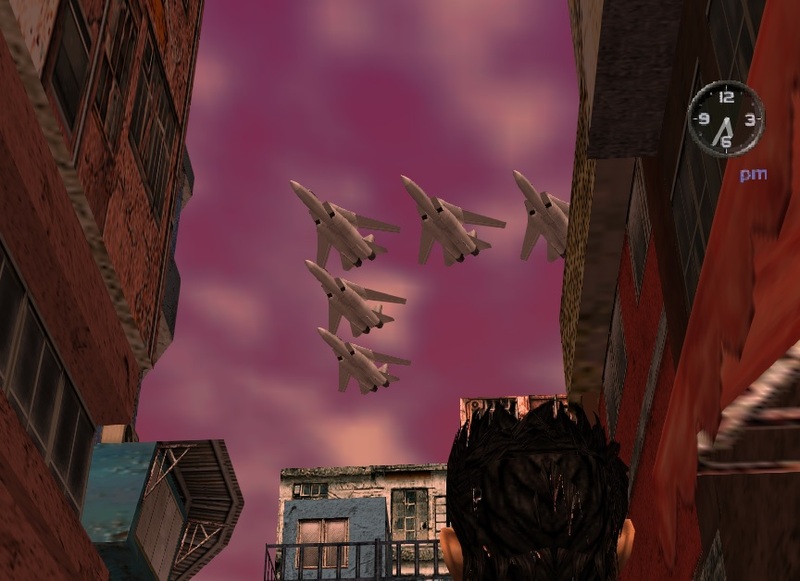 In this less-common cutscene, Ryo looks up to see five fighter jets flying above him in formation. The fighter jets shoot past in a flash, making remarkably little noise. 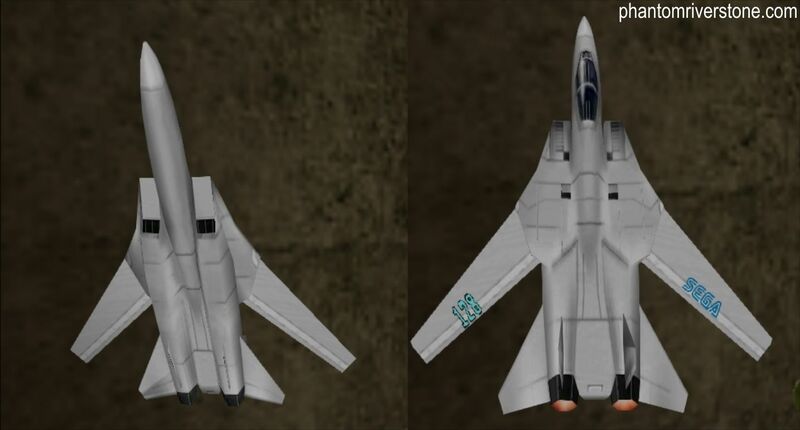 It is interesting to note that the in-game model for the planes is also used for the capsule toy of a F-14XX jet - as found in the AfterBurner 2 arcade game - which can be bought at the AM2 collection capsule machine at the Latest Electronics shop in the Lucky Charm Quarter. (This capsule toy is quite rare though - I had to purchase around 30 capsule toys before I hit it!). The F-14XX capsule toy, a rare member of the AM2 collection. 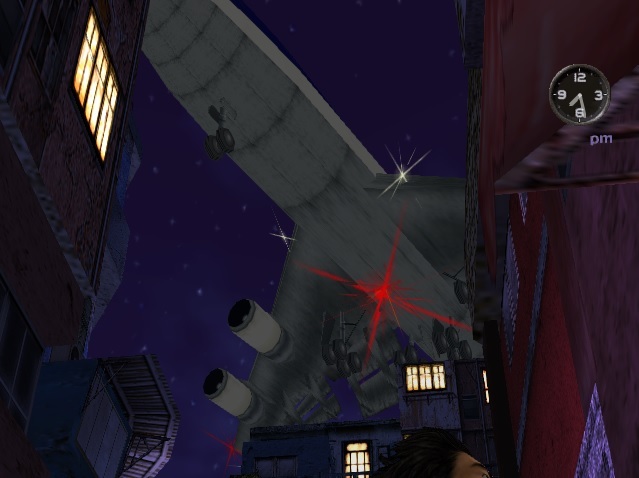 Note the distinctive undercarriage, which matches those of the cutscene fighter jets. 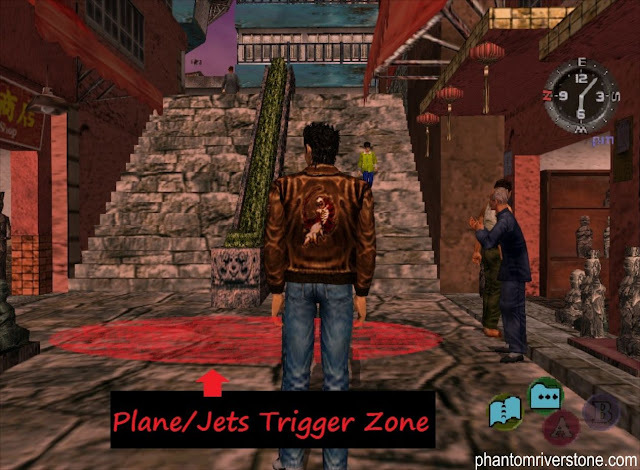 Cutscene Location & How to Trigger: The location and method for triggering this cutscene is identical to that for the passenger jet above - the secret to triggering this scene is in choosing the correct day. Timing: The fighter jet cutscene can only be seen on a specific day, namely the day Ryo says goodbye to everyone before travelling to Kowloon. 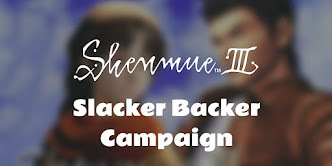 This is the day after the QTE chase scene with Ren where they end up both tumbling down from the scaffolding of a building. 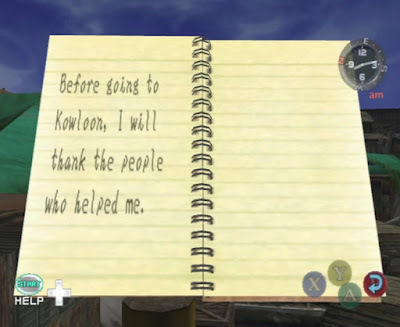 This entry will appear in Ryo's notebook on the day the fighter jets can be seen. Other Information: Even when the cutscene is triggered on the correct day, it will not necessarily be the fighter jets that appear. It appears to be a random chance as to whether it is the fighter jets or passenger plane which fly overhead. In my testing, I sometimes had to trigger the scene three or four times before getting the fighter jets. 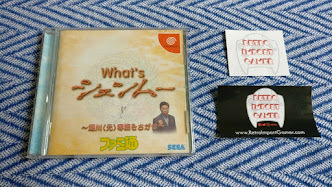 Enjoy triggering both the cutscenes for yourself next time you play through Shenmue II! Thank you so much for this Switch! I have played this so many times on both Xbox and Dreamcast yet have never seen the fighter jet cutscene! It's amazing how many secrets you can find even after 15 years. Glad you enjoyed the easter egg! There's so much packed into the games beneath the surface, isn't there. Can you see both cutscenes in one play-through without reloading saves or can you only trigger the cutscene once per savegame? Yes, you can see both in one play-through and can trigger the cutscene as many times as you like without reloading. 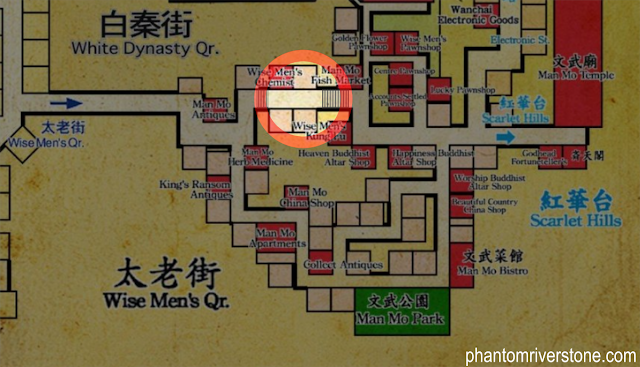 You just need to make sure to leave and reenter the Wise Men's Quarter in order to trigger it again.